Fend off pirates and fight for survival on a mysterious island! 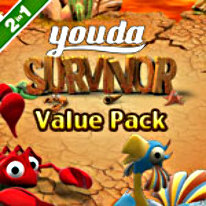 Both Youda Survivor games together in one value-priced bundle! In Youda Survivor, fight off pirates and protect an entire tribe in this epic adventure! The obstacles will be many, but you've got nature on your side and a powerful urge to survive. Then, in the thrilling follow up, Youda Survivor 2, you must gback to the island where it all began and start an adventure that will change you… forever! Help your befriended tribe face your common nemeses once again and retrieve a sacred talisman that's gone missing. -Hours of time management fun! -Survive against all odds on this mysterious island!